If you have a Google+ Page, the next step you’ll want to take is to implement a Page Badge on your website. 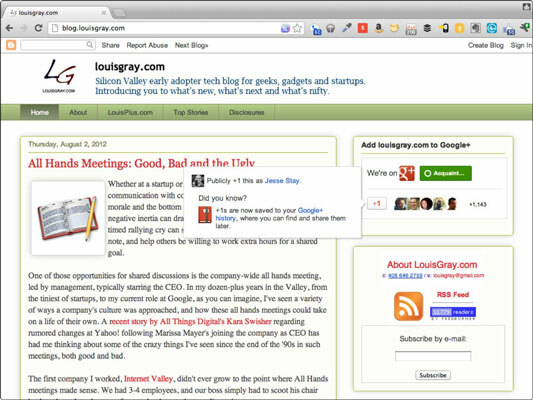 The Google+ Page Badge is a little widget that you can put on your website to point visitors back to your Google+ Page. It allows visitors to +1 and circle your Google+ Page without ever having to leave your website. It verifies your Google+ Page as being owned by you. Not only does your Google+ Page Badge show your visitors that you own the Google+ Page, but it also tells Google+ that you acknowledge this Google+ Page as yours. Then Google+ can put a Verified check mark next to your Google+ Page’s name, signaling visitors that it’s the real deal. This assurance of authenticity means more people circling your page, more people +1’ing your page, more people visiting your website. It allows visitors to follow your Google+ Page from your website. Because they can circle your Google+ Page right in the widget, visitors can stay on your website when they follow your Google+ Page — which means a much longer time on-site for each visitor. It improves your website’s search ranking. Google views every +1 that your Google+ Page gets as an endorsement for your brand. If you’ve linked your website to your Google+ Page, that gives your website authority — and when people search in Google.com, Google will rank your content higher than content from websites that don’t have this authority. The more authority you can give your website, the better your rank. It gives you a shot at getting a Direct Connect Listing in Google.com search. The Direct Connect feature puts your Google+ Page in the suggestions that show onscreen as a visitor types in search words on Google.com. If you preface your search with a plus sign (+) and it includes your Google+ Page’s name, Google may allow your Google+ Page to show up in this advantageous position, taking users right to your Google+ Page from the suggestion. This feature only works for some Google+ Pages at the moment; keep in mind that you must link your website to your Google+ Page before the feature can work.